Below 300 dpi « Global Market Insights, Inc. In recent times, barcode printers market has been witnessing rapid expansion owing to the cutting-edge products being unveiled by prominent industry players and their consistent adoption of strategic growth tactics. Citing an instance of the latest product innovation, Printronix Auto ID Inc., one of the global leaders partaking in industrial barcode printing industry, has launched a high-performance thermal barcode printer, the T6000. Equipped with advanced features such as an enhanced print speed of 14 inches per second, an interactive screen which lowers downtime, postscript and pdf support for complex labelling requirements, and improved RFID capabilities, this product is indeed revolutionary. It would also be imperative to state that this latest thermal barcode printer seamlessly integrates with any network infrastructure with plug and play facility and comes with unique online data validation process which assists in producing barcodes that eliminate exorbitant compliance fees. Such dynamic and encouraging technological advancements in product development are set to favorably influence the growth prospects of barcode printers market in the upcoming years. According to research analysts, the global barcode printers industry size stood at USD 2.4 billion in 2017. Thermal barcode printers have indeed found commendable traction over the years in various industry domains due to their outstanding thermal transfer technology. Embedded in thermal barcode printers, this technology offers long-lasting labeling applications, which have in turn found extensive usage in printing cards, magazines, posters, picking and shipping labels, receipts, and books. Evidently, the adoption of these printers has had a major impact on barcode printers market outlook. Indeed, thermal-based printers account for more than 65% of the overall industry share and are likely to gain commendable returns in the ensuing years owing to their excellent durability and low operational costs. Concurrently, the diverse applications of barcode printers are increasingly being deployed in the healthcare industry. Noteworthy applications such as desktop barcode printers in particular, are contemplated as an ideal product for the healthcare industry, as they have helped boost the efficiency and productivity of medical care operations. The product has emerged to be of immense use in hospitals as it offers accurate patient information, enhanced medicine administration, parcel post, specimen collection and identification, shipping/receiving labels and patient identification. The growing demand for products such as barcode-based wristbands for patient identification will thus drive desktop barcode printers market trends over 2018-2024. Meanwhile, it would be well advised to enumerate the challenges that would impede the growth potential of barcode printers industry in the longer run. The vertical apparently, has been marred by the low printing quality of labels, add to it the rising prominence of Radio Frequency Identification (RFID) tags. In the years to come however, these restraints are likely to take on a turn for the better, as companies continue to conduct R&D activities to develop innovative solutions with a high level of reliability. Speaking of the regional expansion outlook, Europe barcode printers market is likely to garner appreciable return in the coming years. This growth can be primarily attributed to the rising deployment of these products to improve customer experience and visibility. The ability of these systems to enhance efficiency and lower costs incurred through errors in shipping, packing, and manual input enables companies to achieve high Return on Investment (ROI), thereby impelling the regional barcode printers industry share. This business fraternity is anticipated to witness intense competition among the major industry players such as Printonix Auto Id Inc., Epson America Inc., Toshiba Tec Corporation, Zebra Technologies, Honeywell Scanning and Mobility, Dascom, Printek, Seiko Epson Corporation and Godex International Co. Ltd., etc. In a bid to strengthen their positions across the vertical, companies have been highly vigilant as far as conducting robust collaborations and alliances is concerned, as enumerated by the partnership between the leading barcode printers’ producer, Epson America Inc. and the barcode labeling software manufacturer TEKLYNX International. The alliance features the seamless integration of TEKLYNX barcode label design software and Epson’s inkjet color label printer that would provide GHS-compliant chemical barcode labeling for all the sizes in the manufacturing industry. As the adoption of lucrative growth tactics among market participants surges in the years ahead, barcode printers industry trends are likely to undergo a major transformation. 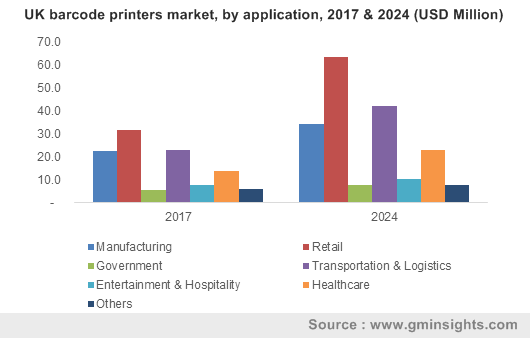 Having been pegged at a valuation of 3 million units in terms of shipments in 2017, barcode printers market size has been forecast to register a CAGR of 5% over 2018-2024. This entry was posted in Electronics and Media and tagged Above 601 dpi, Barcode Printer Market, Barcode Printers Market, Barcode Printers Market Share, Barcode Printers Market Size, Below 300 dpi, Between 301 & 600 dpi, Connectivity, Desktop, Direct Thermal, Impact, Industrial, Inkjet, Laser, Mobile, Product, Resolution, Technology, Thermal Transfer, Wired, Wireless.